Arnott’s Tim Tam has launched a new limited edition range of gelato-inspired flavours, with an accompanying social and outdoor campaign to promote the new biscuits. The new biscuits, Choc Mint, Salted Caramel & Vanilla, Coconut & Lychee and Black Forest will be available for the next 12 months and were created by food technicians out of Tim Tam’s western Sydney HQ. As part of the launch, The Kitchen Table Sydney has rolled out a social and outdoor campaign promoting the new flavours. The campaign features images of overflowing Messina gelato cups, with the new Tim Tam flavours embedded in the dessert and the biscuit packets underneath. Tag lines for the campaign include: ‘Shut the front door’, ‘This changes everything’, ‘Hold the phone’ and ‘Say no more’. Declan Lee, co-founder at Gelato Messina, said the collaboration was a “challenge” due to the difficulties of making a biscuit taste like gelato. Lee added the biscuits had to stay true to Messina’s ethos of quality which involves making distinct flavours from high-quality ingredients. 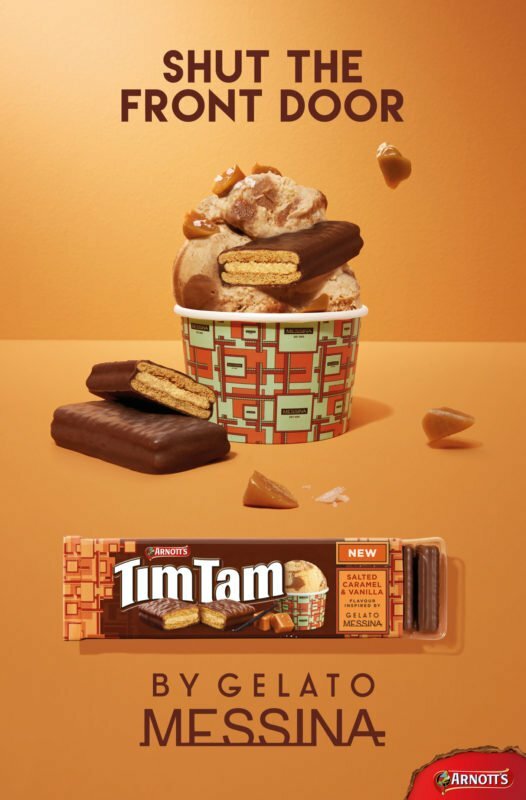 Nicky Thomson, global communications manager at Arnott’s described the partnership and the ensuing limited edition range as the most “exciting” and “innovative” yet for Tim Tam. “Gelato Messina is leading the way in the Aussie gelato movement, and we’re thrilled to pair their expertise with Australia’s most-loved chocolate biscuit,” Thomson said.